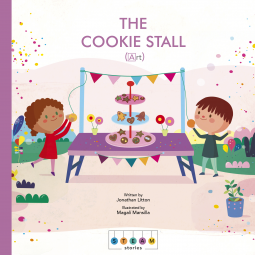 About art: The Cookie Stall – Joyce's mystery and fiction book reviews with some non-fiction too! This STEAM series entry is for the “A” in STEAM, art. The book will appeal to four to seven year olds. Max and Suzy have baked cookies and would like to sell them but, alas, they have no customers. With the help of their art teacher, the two learn that they have to make their stall more visible and appealing. They discover that art will help them to do this. Max and Suzy decorate with fine results. Along the way, they learn about primary colors and how to make secondary colors. They also find out that art doesn’t have to be neat to be something to enjoy and take pride in. There is an added learning section in the back of the book. It also includes some suggested websites. Thanks to NetGalley and the publisher for another book in an excellent series. The opinions are mine.